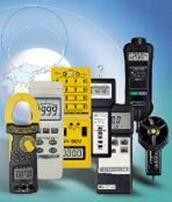 Laser Levels, Distance Meters and others | Test and Measurement Instruments C.C. Please contact us by phone, fax, email or visit us at the details given above. We look forward to hearing from you. Test and Measurement Instruments C.C. TL180 Mini 2 Line Cross Laser Level, Self Levelling, Low cost, Ideal for building applications, ceilings, laying ceramic tiles etc. Can use with tripod. TL360R 360° 3-Plane Levelling and Alignment Line Laser Level, Self Levelling. High Quality, ±3mm/10m, IP54, Weight : 0,9 kg. 80 meter Laser Distance Meter, Memory , Data Storage and Recall, “+” & “-” Operations, Area, Volume and Indirect Measurement & Pythagoras. 1.5mm accuracy. 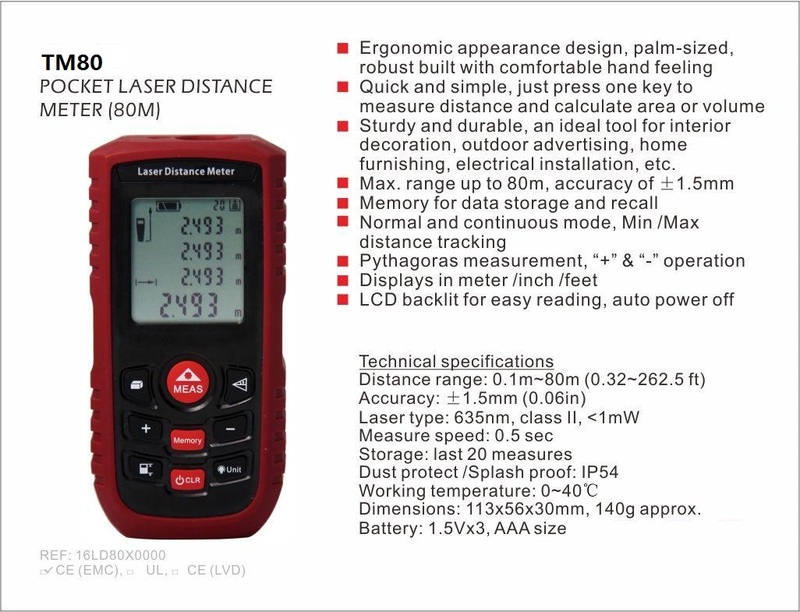 Laser Distance Meters Models 416D, 411D. Instant Measurement with easy Operation. To 60m, reducing Measuring Time. Audible Feedback. Distance Meters using Laser and Ultrasonic technology measure 50m with laser and 18m with ultrasonic or 75m with ultrasonic target. 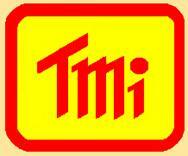 Fluke and T+M brand names are on offer below. Notes on Ultrasonic and Laser Distance Meters. Electronic distance meters use the principle of transmitting either a beam of laser light or an ultrasonic sound that the human ear cannot hear. The instrument then measures the time that it takes for the pulsed light or sound to be received after bouncing from the subject, and then calculates the distance travelled using the speed of sound or light respectively. · When the object to be measured is either partially obscured by another object, it will read the distance to the fist object. · When the subject object is small, the reflected signal is of low density, thus resulting in inaccurate results. Both of these above erratic conditions are solved by the laser units. Laser units can be used up to 200m distances, while ultrasonic units can only be used up to about 18m away. Invite a Friend to this Site. 1200 meter Laser Distance Meter, Measures angle and height , distance. Ideal for golfers taking slope into account for shot. Various available. Please enquire. All brands, trade names, trade marks, and logos are the property of their respective owners.